It's a project that a friend and I put our hand up to do almost 18 mths ago. it for another quilter who was unable too. Tuesday to lend a hand too. They have willingly helped and we are almost complete. 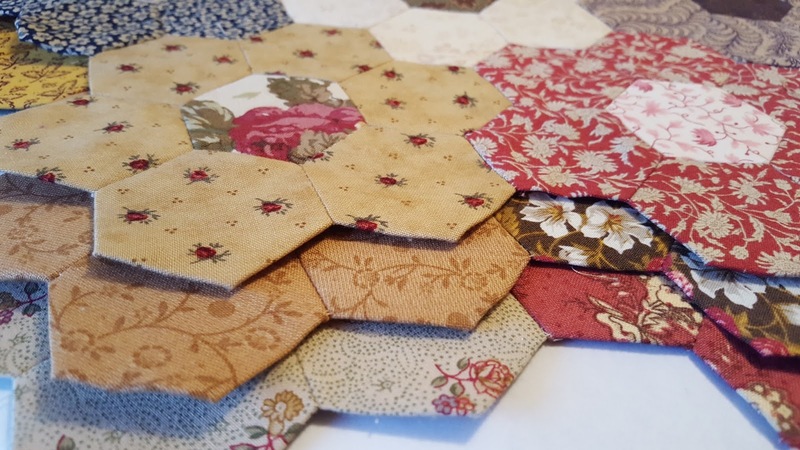 We have sewn lots of hexi flowers together and now are up to sewing the rows. Next will be the finishing edges...it didn't come with a pattern, so we are just winging it as we go. Check back next Wednesday to see how far we have progressed. How lovely to finish off the quilt, enjoy. Looking forward to seeing it completed. love your new banner...very pretty1 love all those hexies too...I've got a single bed size one ready to be quilted..started it in 2012! It is looking lovely. Those hexagons are addictive I think. Oh, so lovely! Very nice of all of you to finish it, too. I always want to know what measurement the side of the hexagons are, and almost no one ever says! It will be a lovely top, whatever size they are. I hope you show the finished top. 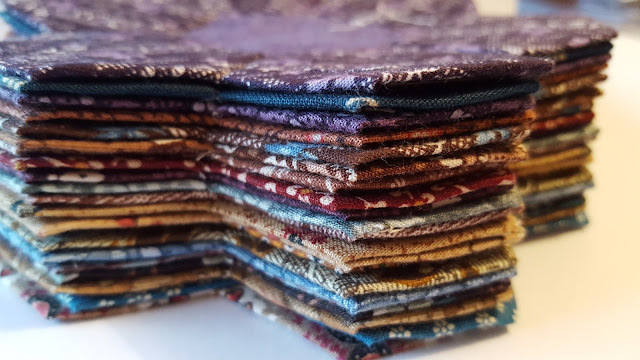 yes, Hexies are long-time-projects. I just finished my top with 4cm Hexas. It is now 165 by 245cm and waiting to be quilted. It took me nearly 5 years to finish this top. A visit to Hat Creek Quilts!